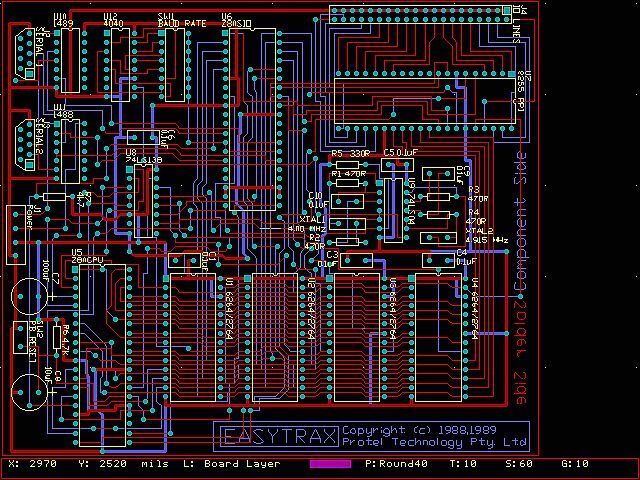 EasyTrax is an early PCB layout programme from Protel in Tasmania. It is now officially abandonware, and continues as a user-community-supported system. As somebody with a professional background creating many Bishop Graphics peel-stick PCB artworks, now that I have come to grips with EasyTrax I think it's a great tool; just enough, and not too much. It started life purely as a PCB layout programme, and for a programme that is now freely available as officially “abandonware” it is very real-world functional and has some really serious output formats such as Gerber drilling file. And it produces precise size printouts from every printer I've tried, (in itself something of a miracle). It now has additional user-generated libraries of components suited to circuit drafting, rather than just PCB layouts, and makes a reasonable all-round drafting tool for speaker boxes to house construction. I have “built” several folded horns in EasyTrax, to great benefit, before cutting wood. It is also a good tool for moving things along. I'm not going to explain the mechanics, only to say that when you get going EasyTrax is like an arcade video game. While the mouse is useful for rapid slewing, it is not vital and in fact often useless; for just about everything else keyboarding logical two-letter commands like P-lace T-rack, and the cursor and number pad having different sensitivities, it has the user-interface MS Flight Simulator should have been born with. I use about 80% keyboard/20% mouse. You use the esc key a lot to get back to the main level, but frequently used functions such as zoom in and out (pgUp and PgDn), and switching layers (numeric + and -) provide very intimate control over what is a demanding process. Unlike most of the simpler CAD/Drafting programmes, EasyTrax has simple and effective means to move stuff around. This is particularly needed when doing PCB layouts, but is also bloody handy when planning a speaker box or building. EasyTrax is more CAD than most, while a lot less than AutoCAD. But if you're not actually building a Stadium, Jumbo jet, or CPU silicon, you are unlikely to exceed its CAD capabilities. Sample demo artwork supplied with some packages. As far as I can tell this is an actual Z-80 based SBC. What is EasyTrax good for? The first thing it's good for is what it was intended to do, be a much better way of preparing PCB artworks. It's the tool I dreamed of while spending many hours at the drawingboard struggling with yet another custom PCB. The wordprocessor/text editor brought to typewriting the ability to go back to correct errors and move text about in a more flexable way. PCB layout programmes similarly brought the ability to pick up a component, or a whole layout, and move it, when previously it would mean ripping off hours of work laying sticky graphic symbols and starting again. The big horror with a complex layout is getting to an edge and finding yourself half the width of an IC short of space. Tools like EasyTrax make it almost trivial “snugging up” a layout to fit it all in. In fact I now have to be careful of old habits when applied with EasyTrax results in layouts so “efficient” they are hard to physically build. Even before the circuit symbol libraries appeared I was using EasyTrax for all sorts of other general non-PCB drafting applications such as complex W-bin speaker boxes, frontpanel artworks, and building plans. But why would you do a PCB layout for a circuit if you didn't intend to actually etch a PCB? Most of my constructions are one-off's and not worth the trouble of trying to transfer an artwork to copper laminate for etching, but the various plots available from EasyTrax have also been very effective applied to dab and strip-board construction. Now I'll confess that when it comes to projects I have a couple of problems. The first I think is very common; making that initial step between design and the first cut. The second may just be me, but I tend to glaze over at the sight of stripboard - it seems so featureless that I simply get lost. So I tried cutting out the layouts and gluing them to the component side of the target board, and with stripboard sometimes the copper side as well. This has had several effects; once the layouts are finialised and printed out it is easy to shift to the actual construction, sure you won't have to undo anything due to poor layout on-the-fly; builds become almost literally a “no-brainer” in that you simply assemble the kit you have composed; and my “hit rate” of wiring errors and go-first-time have improved considerably. Long think - short do. So the two aspects are; if you are going to build anything at all it is worthwhile drawing it first. Of all the CAD packages I've seen and used EasyTrax is the most effective and practical. Few projects need all the bells and whistles of AutoCAD, and most other PCB/CAD software is poor to shocking. And unlike AutoCAD it's very quick on old iron. Here is a snapshot of what is available on the Web related to EasyTrax (Google). The “RCS distribution” is discussed below. Open Collector lots of open source electronic design tools. PCB maker RCS Radio in Sydney have long been major users and boosters for EasyTrax, and one of the main distribution packages was assembled by them. In ibmezcad.htm there is a file that lists what all the others do - easyread.rcs. These files when auto-uncrunched will produce all the necessary files to operate the EASYEDIT.EXE and EASYPLOT.EXE programs. These files have been zipped up from an operational sub-directory C:\CAD\ET. The colours have been pre-configured - change if you wish. These 2 programs when run (exploded) will result in a zillion files, drivers, etc. - do not be alarmed - just panic. Free, old DOS Version EasyTrax available for download. Format supported by PCB-POOL®. 54. EasyTrac v2.06 Powerful package for producing printed circuit artwork. Has Component library support and full plotting capabilities. 55.  easytrak.exe 45k EASYTRAX GLOBAL Track Width Converter. easytrak.exe 45k EASYTRAX GLOBAL Track Width Converter. Note: ezschem1.lib is the library containing schematic/circuit symbols, the PCB physical symbols are contained in standard libraries already in the easyfree.zip distribution. This allows you to convert Easytrax's .PCB files to Autotrax .PCB format. Freeware. File Size: 459.7 KB Estimated Download Time: < 1 min. T1 (1.5M), DSL/Cable (768K), DSL/Cable (256K), Dial-up (56K).